Hello my FAITH-ful readers! I hope you’ve been shedding your winter coat and getting ready for spring! I have some ‘paw-some’ news that will make your tail wag at full speed! 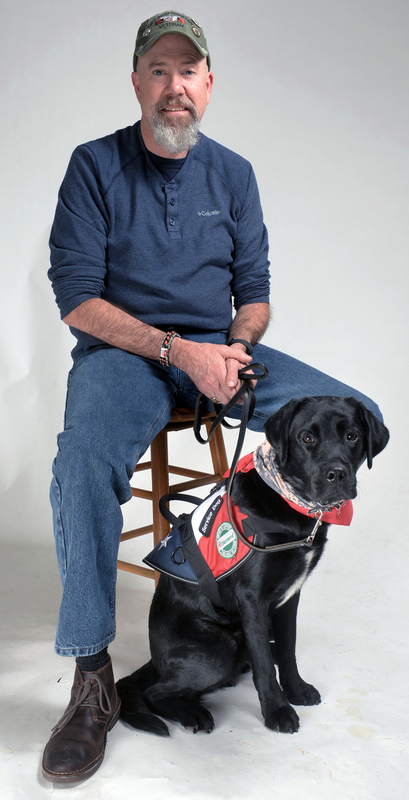 With your support, veteran Greg and his service dog TOMMY have recently been welcomed into the maCares & faith Cares Service Dog Support Program!! 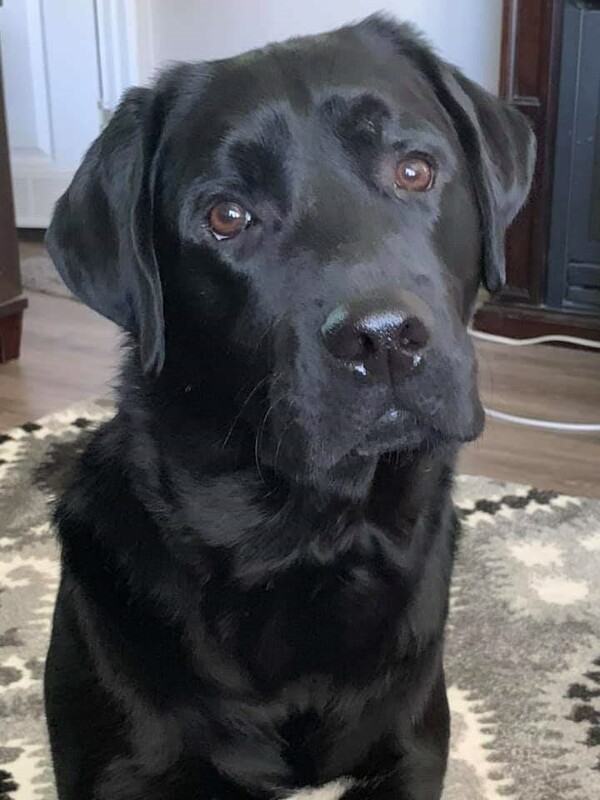 TOMMY is a black labrador named after singer Tom Jones, as it was thought his solid black coat and white patch on his chest resembled Tom Jones when he was on stage. Greg and TOMMY teamed up in late 2018 to work together to mitigate symptoms of Post-Traumatic Stress due to Greg’s service for 28 years in the United States Navy. Greg served in Norfolk, Operation Desert Storm, and Afghanistan as an electronics technician before retiring as an intelligence and information assurance officer. Two of the tours he served as Commanding Officer and one tour he served as Executive Officer. TOMMY assists Greg by diffusing anxiety escalations, navigating around crowds and stressful environments, interrupting nightmares, providing deep pressure therapy, and helping Greg to complete work tasks. Greg and TOMMY like to spread awareness about the benefits of service dogs. The pack and our 2-legged friends are so excited that Greg & TOMMY have joined the maCares family! Please help us celebrate and support them! To learn more about the service dog teams you are helping when you support maCares, check out all the maCares & faith Cares sponsored service dog teams by clicking here. The sponsored service dog teams are relieved of the daily care costs of their service dogs, allowing them to focus on living life together! One of the ways you can help support teams like Greg and TOMMY is by purchasing maCares branded items like shirts and backpacks, OPERATION UNIFORM wristlets and crossbody bags, and more! Click to view all the ‘paw-some’ items in our Online Shop or our Facebook Shop. maCares would not be able to make a difference in the lives of others without your continued support. Please view our list of upcoming events online or on our Facebook page to get involved. Together we can help more service dog teams and rescued animals in need! We hope to see you soon at an maCares event. Be sure to check back soon for updates on upcoming news and events from yours truly. My name is FAITH, and I'm a service dog to Sgt Terry White, PH IOF. You've probably seen me around the Market America office or at one of their events. I'm the pretty blonde with the big smile The wonderful maCares team is pretty fond of me, and they've decided to devote each Friday's blog post to my stories, pearls of wisdom, and "tails" of others giving back to their communities. We'll call it "Fridays with Faith". What you may not know about me is that I'm named after someone special. The flag that represents this great country flies high on the flag pole for my namesake's sacrifice. I am named in memory of U.S. Army Sergeant Faith Hinkley, who died on August 7, 2010 in Iskandariya, Iraq. Faith was part of the 502nd Military Intelligence Battalion, 201st Battlefield Surveillance Brigade, Joint Base Lewis-McChord, Washington. Through me, Faith Hinkley's legacy lives on, helping and healing another wounded soldier. maCares loves making a difference in the lives of veterans and animals. Please consider donating or getting involved with maCares so they can continue supporting veterans and dogs like Terry and me, and honoring heroes like Faith Hinkley.